Update! November 27, 2018. This promotion has ended. November is a month full of surprises, great and comfortable Thanksgiving experiences, and much-coveted shopping holidays – and we aim to make it a bit more special for you. Between the 15th and 26th of November, you’ll be able to enjoy our all-in-one Thanksgiving, Black Friday, and Cyber Monday promotion! If you want to unblock your favorite Thanksgiving movies and shows that aren’t available in your country, simply want to enjoy some geo-blocked content from around the world during this holiday, or just want to save some money on Internet cybersecurity, take advantage of our promotional discount right now! 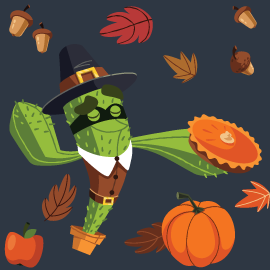 And remember to share the great news with your friends and family, or – why not – purchase some discounted CactusVPN subscriptions as a Thanksgiving gift for them.